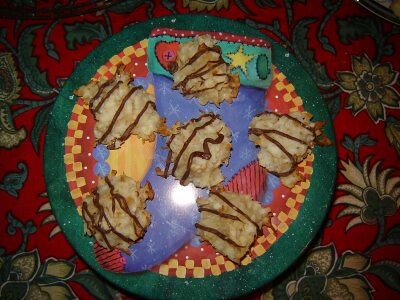 My father in law has one weakness: coconut macaroons! Since he was going to be at our Christmas gathering, I wanted to make him his favorite treat. 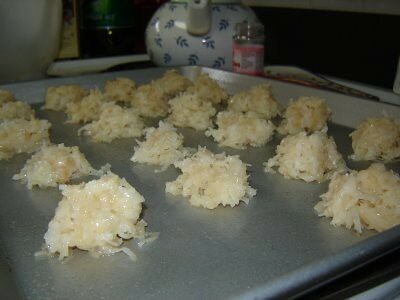 I’ve tested a lot of different macaroon recipes – the ones that use condensed milk seemed promising, but ended up too dry. The ones based on egg whites sounded okay, and they ended up being PERFECT. 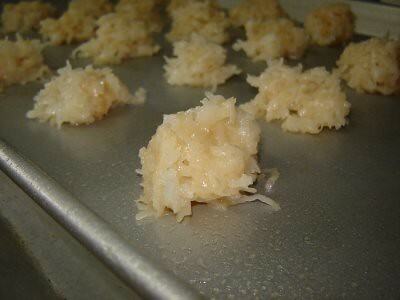 I’ve adapted my own recipe from the one found on the back of Baker’s angel flake sweetened coconut package, and it gets a huge grin and a hug from my father in law every single time! Bake at 325 degrees for 20 minutes, or until edges of cookies begin to turn golden brown. Immediately remove from cookie sheets to wire racks. Cool completely. Put chocolate chips in small microwave-safe dish and microwave in 20-second increments until chips are melted. Spoon melted chocolate into a small zip-lock bag. Snip a small corner off of the zip-lock bag with a pair of scissors. 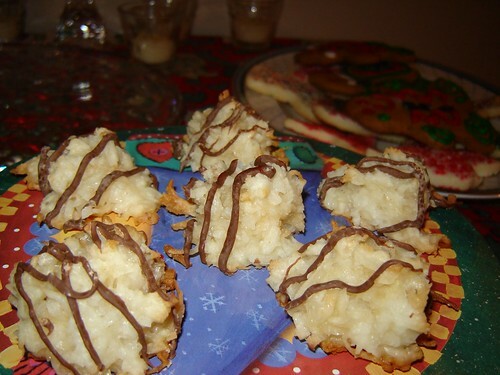 Squeeze strands of chocolate onto cooled macaroons. Allow the chocolate to set before stacking. ©2008 Vintage Victuals. All Rights Reserved.